According to Caballero, the countries with the largest number of graduates are Bolivia, with 855; Ecuador, 718; Mexico, 444; Argentina, 387; El Salvador, 386; Guyana, 280; East Timor, 194; Angola, 118, and China with 101 doctors. 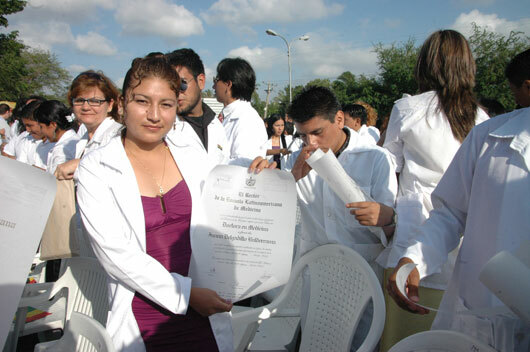 The total number of graduates from all medical sciences specialties this year will reach 29 thousand 712 professionals, with 24 thousand 692 being Cuban and 5 thousand 020 from other nations. The new health specialists are youths with high scientific level and humane values that favor their assistance to the world helpless people. Medical sciences include the specialties of Medicine, Stomatology, Nursing, Psychology, and Health Technologies. Also part of this graduation are Bachelors in Biological Analysis, Hygiene and Epidemiology; Medical Radio-Physics, Nutrition, Optometry and Optics, Rehabilitation, and others. The total number of Cuban medical doctors that have graduated since 1961 up to 2012 has reached over 124 thousand 700. This year’s graduation alone includes is one fold and a half larger than the total figure of physicians that worked in Cuba when the Revolution triumphed in 1959. This entry was posted in ALBA, CELAC, Home, International and tagged Cuban internationalism, Education, health, inspiration, medical doctors, Solidarity by Russell. Bookmark the permalink. So true Ankie. Can you imagine what they would have achieved if they were not blockaded for the past 50 years?